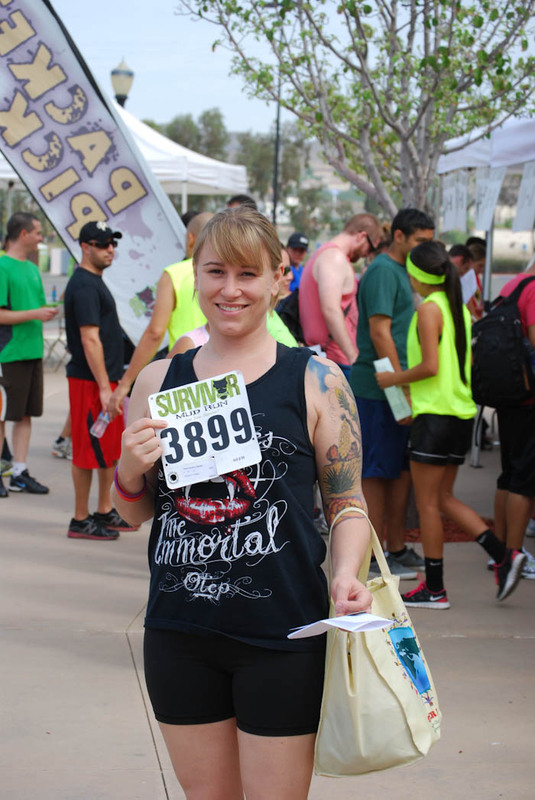 This past weekend, I participated in my very first timed race of any kind – the Survivor Mud Run! I have been preparing for this for months, though perhaps not as rigorously as I should have. The day came, and I got WORKED! So much mud, so many obstacles, so many participants – it was a bit overwhelming, but I tried to take it all in and enjoy it! Boy did I – I embraced the mud with vigor, and was rewarded with cuts & bruises, skinned knees & achy muscles. The day following the race was all about recovering from the beating! I wanted to keep up with the veggie-type theme I had going before the race (I fueled up with a Glowing Green Smoothie, and an Oatmeal/Chia/Banana Parfait). I’d been dreaming of this meal for awhile now, and it was everything I had hoped for! I hope you enjoy it too! First, you start off by boiling a half pound of whole wheat spaghetti, about a half of a box. While you’re waiting for the water to boil, we’ll prep our veggies. Slice up 1 1/2 cups of cucumber – I used an Armenian cucumber here – they’re plentiful at my farmers market, and I just LOVE them! I like to take the seeds out. You can leave them in if you like them! Then toss them in a big bowl. 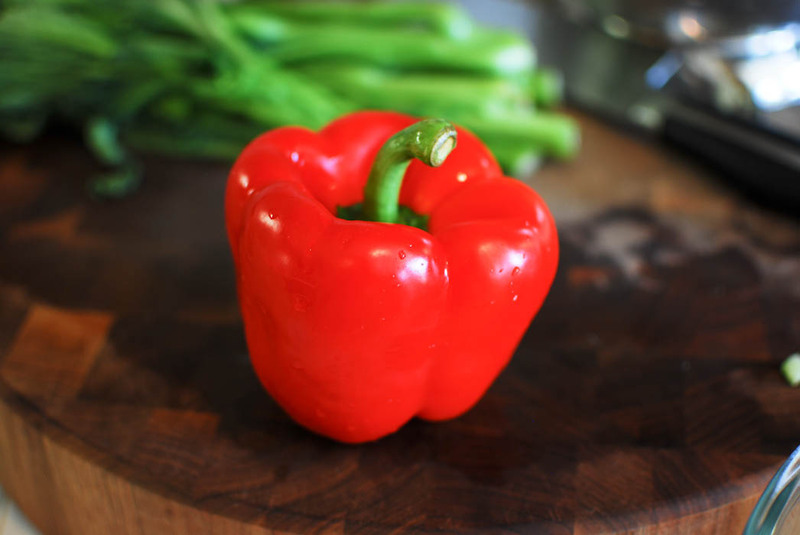 Then, julienne a red bell pepper – you’ll need 1 cup. Isn’t that just the most beautiful red pepper you’ve ever seen?? Love it. Toss the julienned peppers into the bowl. Next up is the red onion. Thinly slice those, and toss em in! The water should be boiling at this point, so throw a good pinch of sea salt in the water, and add the spaghetti. 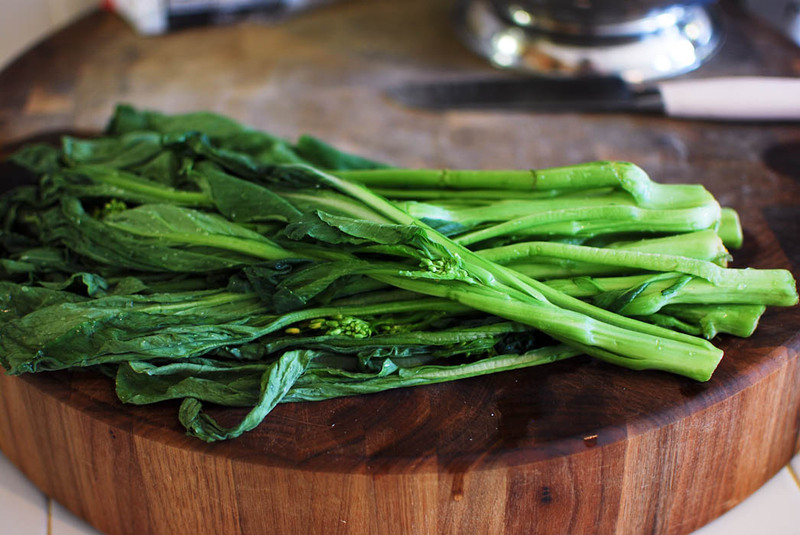 Finally, chop Chinese broccoli into bite-sized pieces, leaves and all. I put these in the bowl last, so they’re on top of the pile. I like to use the heat of the cooked noodles to steam them just a little bit. 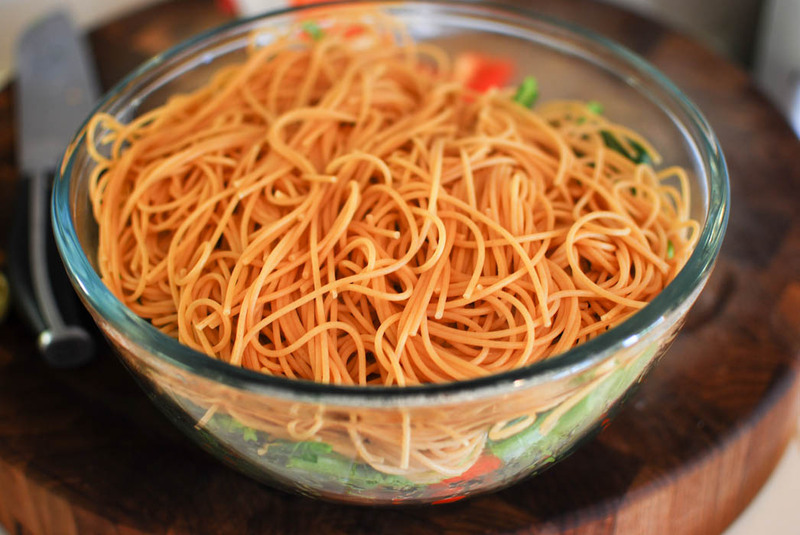 Once the spaghetti is done, pour on top of the veggie mixture, and let the Chinese broccoli steam while you make the peanut sauce. The sauce couldn’t be easier. I like to make this when my peanut butter jar is running on empty – it makes for the perfect dressing mixer! If you don’t have a jar, you could easily whisk the ingredients in a bowl. First, microwave the peanut butter on high for 30-45 seconds, until it’s a little bit melty. Then, add in the sesame oil, rice wine vinegar, soy sauce, siracha, and water. Shake it up (or whisk) until it’s a pour-able consistency, pour on top of the pasta, and mix well! So, after a harrowing workout/run, what’s your favorite recovery meal? Great as a post workout recovery meal! Start by boiling the water for the pasta. 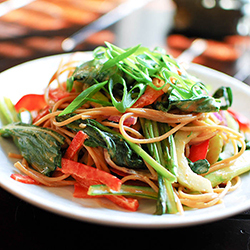 While the water comes to a boil, prepare your veggies – slice the cucumbers, red peppers, and cut the Chinese broccoli into bite-sized pieces, and add to a large bowl, adding the Chinese broccoli last. When the water boils, add in a big pinch of salt to season the water, and add the whole wheat spaghetti. Boil until al-dente, about 6 minutes, drain, then add to the top of the veggies. While the pasta steams the Chinese broccoli, we will make the dressing. Add the peanut butter to an empty jar, or medium sized bowl, and microwave for 30 – 45 seconds, until it’s slightly melted. Then add in the rice wine vinegar, low sodium soy sauce, Siracha, and water, whisking (or shaking if using a jar) until combined. Pour over pasta and mix well, using tongs to combine. 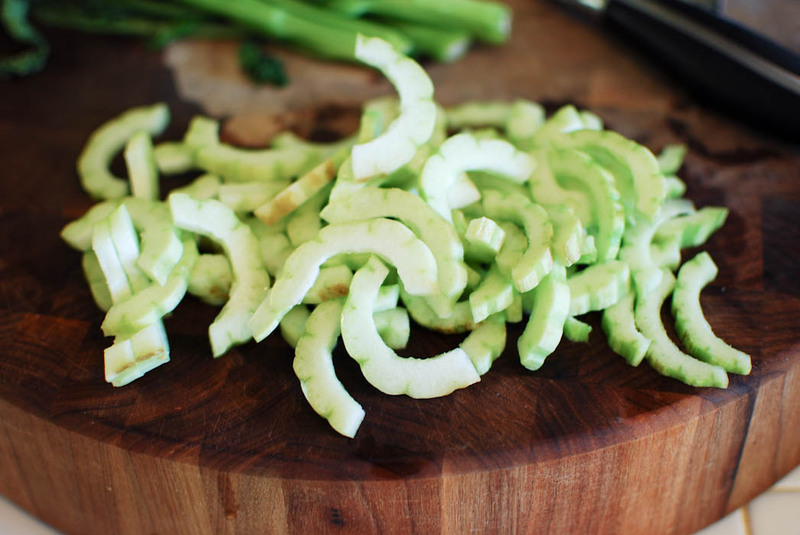 Divide onto four plates, top with sliced scallions, and enjoy! The race looks intense. Good for you for running in it. I thought I would see a recipe for Mud Pie, but you did the right thing, and continued a healthy theme. Looks fantastic! It WAS intense, and I loved every second of it! HA, mud pie would have been GREAT to end that day with! Hmmmmm I see mud pie in my future (after another race, of course)!! Great Pictures! The table and the cutting board you used as a backdrop has some great contrast with your meal and the ingredients. Congrats on finishing the race and not being one of those clean freak pansies. Thanks for sharing your recipe, I will be adding you to my list of links to check for healthy recipes. Hey there Susie! Thanks for reading! The mud run was approx 3.35 miles with obstacles scattered throughout. Very cool that you’re doing your first timed run! 10K is quite ambitious! I’m sure you’ll rock it. GOOD LUCK! 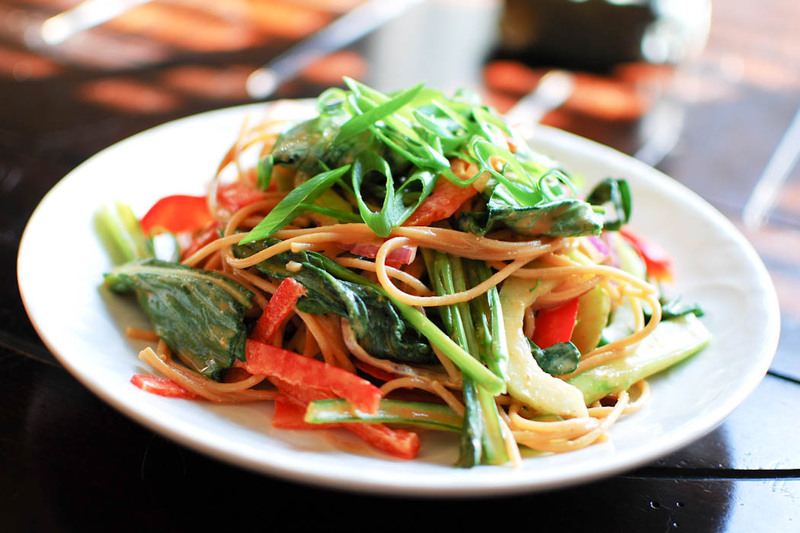 the pictures looks so professional ,and i’m going to try spicy peanut noddles ,sounds good,thanks. I’m about to make this for the 5th time and thought I should take the time to say thanks. I tweak the recipe each time to suit the veggies I have in the fridge but the sause make any combo taste great. Thanks a lot. That’s so great to hear, Kim! Glad you like it!